Reports around the world have stated that more than 1.3 billion individuals live in extreme poverty. China is the fourth largest country around the globe and has a population of more than 1.3 billion individuals. It has become evident that China’s per capita gross domestic product (GDP) does not solve the poverty problem in the country because it is over-populated. That means that the government has to play a huge role in eradicating poverty across the nation. It is also obvious that 50-55% of the entire population in China lives in rural places. Moreover, the inhabitants of the poorest rural areas derive a huge share of income from farming practices that often indicates low levels of revenue. In that case, the most vulnerable representations of the poverty-stricken population include women, children as well as the elderly population. In a speech made by Li Keqiang, it became evident that 200 million individuals in China are living below poverty levels. Distribution of income has created an enormous gap between revenues of people living in China. Therefore, there is a huge part to be played by stakeholders in order to solve the problem of extreme poverty in the country. How Can We Reduce Extreme Poverty in China? There is a need to reduce extreme poverty levels in China because a huge percentage of the population in the country lives below the national poverty line. It has taken a long period for leaders in China to help citizens to have shares of growing wealth. There have been efforts to relocate people from the rural areas to urban sections while at the same time nurturing little towns across China. Leaders have believed that that will play a huge role in solving the rural-urban gap problem. However, this policy has come under various criticisms of lowered food security meaning that other vital strategies need to be put in place in order to reduce extreme poverty in the country. One of the most important strategies will be to fight marginality in China. That will be achieved through de-marginalizing of the rural areas. Moreover, de-marginalization needs development of physical infrastructure as well as institutional settings that can assist in overcoming obstacles. It also enables shifting from the common margins of upgrading by constructing available assets above the natural capital. The country should facilitate accessibility to services that will assist in fostering human capital along with technology. In China, resource endowment along with land degradation is vital elements of marginality as well as identification of agricultural strategies of improvement. In that case, reduction of significant agricultural produce spaces with policy determinants and technological advancements are great opportunities across China. Most importantly, the country should invest in research and development of practices aimed at improving crop production. That will play a huge role in solving the negative traits in poor and environmental constraints faced in marginal areas. Moreover, it should be noted that addressing marginality incorporates several stakeholders including central and local authorities along with civil society movements, local communities, and firms. In other words, eradicating marginality in China is essential in reducing extreme poverty in the country. Moreover, creating shared value will play a significant part in reducing extreme poverty in the country. That means that when establishing decisions for business operations such as product development along with investment distribution, organizations should consider long-lasting values. That way, the corporate sector in China should play a role in examining chances for low-risk or high-risk return investments. That will help in achieving high results integrated with donor public investments including infrastructure in marginal areas in China. These initiatives can include enhancing easy accessibility to improved seeds in farms, health services along with nutritional foodstuff. The research on society can serve solution efforts by regarding innovative concepts that assist in institutional settings that integrate unusual alliances. That can be incorporated into solid effect studies in order to enhance solutions for extreme poverty in China. How Can We Reduce the Gap between the Rich and the Poor? In attempts to reduce extreme poverty in China, efforts should be put in place in order to close the huge gap that exists in terms of income distribution between rich and poor individuals in China. In that case, there should be the implementation of agrarian reforms that can be attained by public procurement elements. Legal changes can be implemented in order to extend land rights for farmers. That should be easily incorporated into the legal documentation of their rights and constraining regular re-adjustments of their land ownership. In that case, there will be an increase in the number of poor families that will acquire legal and secure land tenures where they can practice capital-intensive farming. That will also enhance solutions for social conflicts that have deterred rural development in China for quite a long period. These efforts can be integrated with the ongoing leadership in China that is aiming at committing itself towards developing principles of allowing the market to take part in the allocation of resources. Another way of creating equality between the poor and the wealthy in China would be to use microfinance initiatives. Microfinance institutions should be able to advance loans to women and farmers in rural areas across China as a way of assisting them in expanding their production practices. Providing microfinance tools to people in rural areas such as microcredit plays a role in recognition of the importance of encouraging individuals through raising their accessibility to factors of production such as loans. Most importantly, non-governmental organizations should join efforts in order to enhance poor people to access credits from financial institutions by providing collaterals on their behalf. It has become evident that both informal and small lending financial settings have assisted greatly in striking a balance between the rich and the poor in developed nations across the world. Such microfinance institutions offer people in rural areas accessibility to savings in local sectors and cushion the economic distress. Furthermore, taxation reforms can be implemented in China in order to be inclusive of progressive systems. That way, high-income earners in the country will be charged more in terms of taxes than poor individuals. That means that the more one earns, the more he is taxed. Moreover, creating this tax policy in China will assist in raising revenue towards public expenses that can be advanced to transfers, health sector, as well as education. These outcomes tend to favor low-income earners and the development of infrastructure that will, in turn, enable social equality. Inequality is usually decreasingly pronounced in countries that have effective tax policies and adoption of such initiatives in China will help in decreasing the gap between the rich and poor people. Which Illegal Events Increase Extreme Poverty in China? 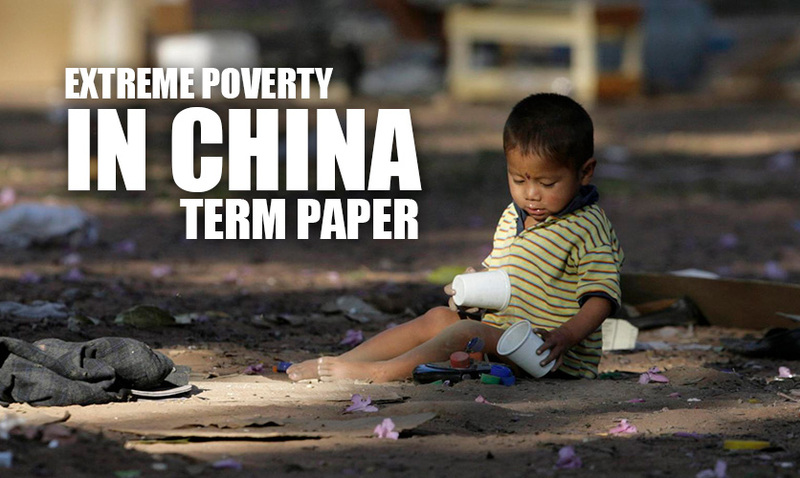 There are several events that have led to increased poverty levels in China. One of them is corruption especially in the land sector. There has been reporting of several cases with peasants indicating that land conversion on tenures has not been openly conducted. In other words, those providing land tenures have been involved in corruption. In that case, the government highlighted statistics of individuals who illegally engaged in corruption activities on the issuance of land tenure to farmers and potential investors. The manner in which agricultural land is changed to accommodate urban development boosted inequality practices in China. Most importantly, administrative instead of market-related land alteration led to a reduction in value of the major assets owned by poor people. That way, poverty has ranged high in China. Corruption is one of the greatest killers of many nations’ economies since it results in an unfair distribution of resources through poor transparency and accountability. China experienced events of corruption meaning that poverty eradication resources could easily be diverted to individuals that aimed at using them for their household development. Another illegal activity that has contributed to extreme poverty in China is prohibited trading of wildlife products. Such products are illegally sold through the internet, and that has become rampant during the current periods. Reports have mentioned that at least eighteen thousand animal items are sold on the internet in China. Such products include ivory and exotic birds among others. Moreover, the shocking scale of trading animal products across the web poses a risk to wildlife across China. In most cases, wildlife plays an enormous role in sustaining the tourism industry in most nations. That means that killing wildlife animals through poaching is a negative activity in China that can contribute hugely towards raising extreme poverty in China. Statistics has indicated that the number of products from wildlife increased from 544 products in the year 2008 to 2061 in 2014. Wildlife destruction can be a major contributor to poverty-stricken nations. In most cases, poaching tends to increase poverty levels, and that has been evident in China where many wildlife animals have been killed for their products to be sold online. That way, wildlife product trading in China has greatly contributed to an increase in extreme poverty levels in the country. In conclusion, it is clear that China’s stakeholders have a long way to go in order to reduce extreme poverty. Looking at the country’s level of poverty, more than 200 million people live in extreme poverty. There is, therefore, a need to reduce it and close the space between rich and poor people in the country. Reducing poverty in China can be done through de-marginalization and creation of shared value. The gap between the wealthy and poor people can be closed by micro-financing, taxation policies and agrarian reforms. There are illegal activities such as corruption and wildlife trading that has immensely affected poverty levels in China meaning that rigid steps should be undertaken against them. Implementation of the right principles and strategies will enable China to reduce extreme poverty.